Away From Home: "They shan't defeat us, we'll fight 'till the game is won..."
"They shan't defeat us, we'll fight 'till the game is won..."
I've always stated we, as football supporters, have no control over anything the players and management do. We can't make a game changing substitution, we can't tell Steven Pressley who to pick, we can't affect change in any way for 90 plus minutes. What happens on the pitch is in the hands of our heroes and the gaffer, we're there to be entertained, to see the Sky Blues win and to witness an occasional glimpse of class. 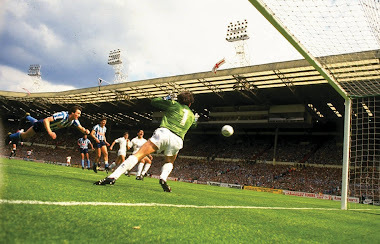 These glimpses of class were regularly on show at Highfield Road, from Mark Hateley to Steve Hunt, Terry Gibson to Michael Gynn, Dave Bennett to Big Cyrille through to messrs Whelan, Huckerby and Dublin. 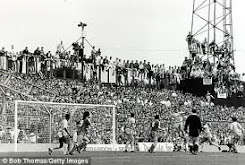 Along with visiting stars like Peter Beardsley, John Barnes, David Rocastle, Ian Rush, Ian Wright and Bryan Robson there was quality on show each time you went to our former home of football. You knew the names of all the players who were numbered one to eleven, unlike the modern era. The players talked to the fans, even the manager signed an autograph, unlike now. A programme cost no more than £1 and you could park for free, unlike now. Then it all went a bit wrong and after 34 years of top flight football we welcomed Grimsby Town and Burnley to CV6...and they went home with the points. Eric Black gave us four months of free flowing football as Bjarni Gudjonsson and Gary McSheffrey linked with the finally fit Julian Joachim to bring hope and optimism to City's faithful following. To quote modern day City journalist Kieran Crowley it was 'liquid football' - what a great phrase. Then, Mike McGinnity's ambition got the better of him as he brought Peter Reid into the hot seat...only to call on the services of former favourite Micky Adams just six months later. 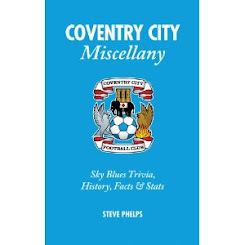 Micky's City side began life at the Ricoh Arena and, with the introduction of Don Hutchison and Dennis Wise, oversaw an eighth place finish in May 2006. 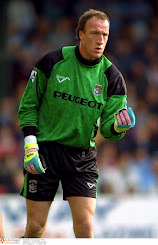 SISU Capital and Ray Ranson rode into town and signed a wealth of talent as Keiren Westwood, Scott Dann and Danny Fox lit up the arena with fantastic shot stopping, the ability to defend and a repertoire of free kicks not seen since the days of Oggy, 'Killer' and Stuart Pearce. Then, we stopped talking about the football and the eleven men who took to the pitch every Saturday afternoon at 3pm. The ground share has torn Coventry City supporters apart from the club and each other. Last Saturday I witnessed one of the best City goals I've ever seen when Franck Moussa fired in his tremendous strike at Vale Park. 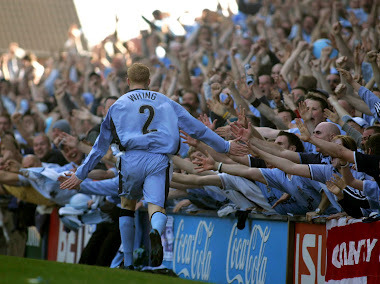 For a few moments it provided over 3,000 supporters directly in line with him that glimpse of magic so rare nowadays. Looking back through the memories I can recall Don Hutchison's volley at Elland Road, Danny Fox at Norwich, Ritchie Partridge's Boxing Day strike versus Reading and Gary Mac's dipping volley against Derby. They remain in the memory as these glimpses are so few and far between, we've pined for a cult hero since Big Mo, we thought we had one with David McGoldrick but, he too, was allowed to go elsewhere. At Highfield Road genius was the norm, especially when Robbie Keane and his entertainers took to the stage. The best memories for me down the years have come from night matches, especially those at Highfield Road. You always knew if City were attacking the West End in the second half any deficit could be overturned. There was something special about a ground we needlessly departed in search of individual greed and benefit. In its final season the wonderful theatre was filled just once but left a memory that we will never forget on that April day in glorious sunshine as Jimmy Hill led his rendition of the Sky Blue song. Then, people got greedier and the beautiful game evolved into a business. Supporters, once valued and appreciated, are now the last thought as the money men focus on their investment, this in an era when the cost of following your team has never been higher and continues to soar. 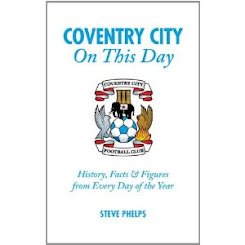 Three years ago I wrote 'Coventry City On This Day', a calendar history of our wonderful football club, there is simply no finer club in the country but that's just my opinion. 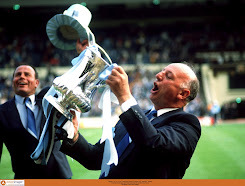 I began watching in 1979, many others go way back, what we all have in common is the desire for our club to return to its rightful place in the City of Coventry. Once the wrongs have been righted our club can get back to where it belongs and there will be no set of supporters more deserving than the Sky Blue Army. Two goals which stand out for me personally (@RNTomlinson) - Danny Fox at Norwich and Franck Moussa at MK Dons last season. Going to be hard to beat those, as unfortunately, I wasn't able to go to the Vale game to witness Moussa's strike Mark II. Great call on Moussa's solo genius at MK last season. Danny Fox's strike followed numerous free kicks that probably played a major part in him moving to Saints. All we need now is a City player to score a hat-trick, its only been nearly four years since Eastwood's against Peterboro'.